Is Snowshoeing Hard? How Hard Is Snowshoeing Actually? I’ve been asked that question for quite a few times by friends and relatives, and my immediate answer has always been as simple as “no”. Really, when it comes to basic techniques, snowshoeing is the easiest compared to other winter sports like snowboarding and skiing. You just need to get used to stretching your legs a bit wider to accommodate the large composite decks of your snowshoes. Everything else is pretty much intuitive and you can entirely count on your instinct. Still, you should know that snowshoeing is pretty tough a workout. If your body is not conditioned well, you’ll likely find yourself catching up breath even before one mile. It’s essential for new snowshoers to be aware of their own limits and to not exert themselves too much in the first outing. Moreover, while snowshoes are designed to keep you floating above the snow, you’re still bound to sink a one to three inches deep. Over time, the snow will build up on your snowshoe decks (unless you diligently shed it off), making the walks even heavier. Knowing this, you may want to start to get used to walking first and strengthen those leg muscles of yours. Get the Right Snowshoes: This mostly refers to the size of the snowshoes. The width and length of your snowshoes affect how they’ll perform on the snowy trail. For hard packed snow, you’d better off with a smaller pair. However, if the snow is soft and dry and there are heaps of it, you’ll need larger snowshoes. You may not like them since they can be heavy and awkward to move around but you need the extra surface area to keep your feet above the unconsolidated powder. Try Out Your Gear: Don’t wait until you have the time to hit the trailhead to try your new snowshoes. Try them out the seconds you’ve got your hands on them. Be sure you unbox them outside because the steel crampons may damage your fancy floor. Try to strap them on with your hiking boots. Figure out the fast way to unlock the bindings. Familiarizing yourself with the bindings can really reward you on the trail. Besides, you don’t want to look puzzled and clueless on the trailhead, do you? Dress in Light Layers: If you have partaken in a snow sport before, I’m sure you agree that dressing in layers is the best way to stay comfortable. Only with snowshoeing, you make them layers lighter. Like I’ve said earlier, snowshoeing is an intense aerobic workout. Unless you don’t mind getting all toasty and sweaty, you really don’t need much insulation. It’s okay to feel cold for the first 5-10 minutes because after that your heart rate is going to hike up and your body temperature will increase steadily. Don’t Go Too Far on Your First Hike: It doesn’t matter if you’re a regular hiker or an indoor person, you should never go too far on your first snowshoeing trip. 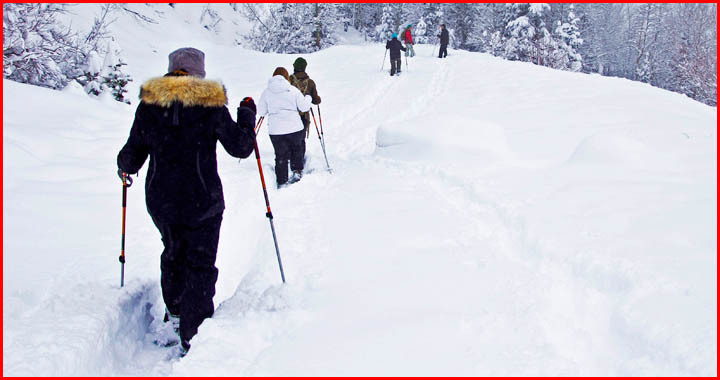 Due to the intensity, even an avid hiker will gasp for breath in his/her first snowshoe outing. This is even more likely to happen if you forget to pace yourself wisely. Don’t walk too fast, especially in the first few minutes. Snowshoeing is not about who completes the trail first. Behave Yourself: There’s this common etiquette shared by all snowshoers that they have to stay away from ski tracks and you have to respect that. Any trails that have been stomped by snowshoes will be too rough for skis. It may even cause someone to fall. If you accidentally run across skiers, quickly move aside and be polite to anyone on the trail. That’s about all you need to keep in mind when planning your first winter hike with snowshoes. Stay tuned for more tips and tricks about snowshoeing. Should you have anything you’re not sure of, be sure to drop the question on the comment.